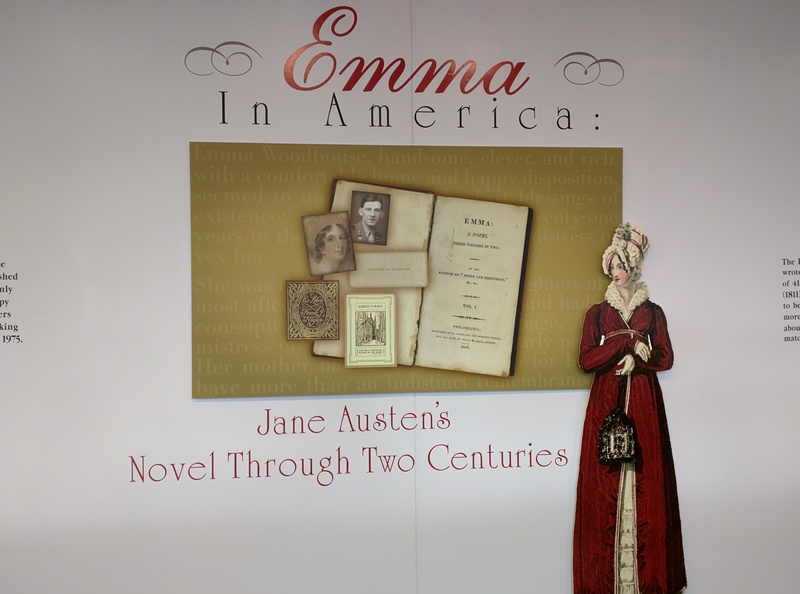 I was thrilled to take a drive down to Baltimore recently for the opening reception for Goucher College Library’s Emma in America exhibit, celebrating 200 years of Jane Austen’s novel (which actually was published in late 1815, though the title page says 1816) as well as the 200th anniversary of the first publication of one of Austen’s novels in the U.S., also Emma, by Mathew Carey of Philadelphia. Though I never met her, Alberta Burke is a personal heroine of mine. Goucher College Library owns one of the extremely rare copies of the “Philadelphia Emma“ (there have been six copies identified, though there may be more out there; Carey published 500 copies) through the generosity of alumna Alberta Hirshheimer Burke, who bequeathed her large collection of early and rare editions of Jane Austen’s novels, as well as books and periodicals of and about Austen’s time, to Goucher College Library. (Though I never met her, Mrs. Burke is a personal heroine of mine.) Among her treasures was a copy of the “Philadelphia Emma” that first belonged to the Countess of Dalhousie, whose husband was the Governor of Nova Scotia (paging Sarah Emsley!) from 1816-1820. For this opening event, the library staff also put out some of the rare editions from Mrs. Burke’s collection. which were very exciting to see. 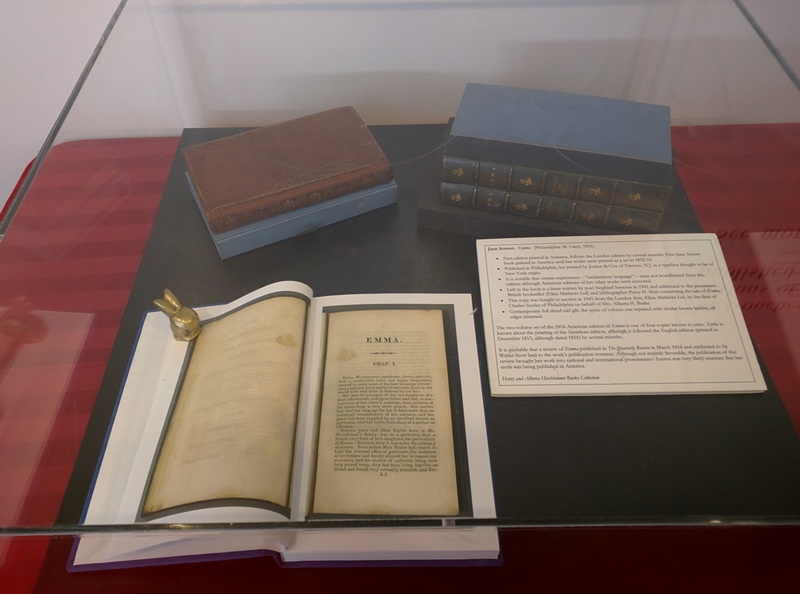 The exhibition, which includes images and information from the Philadelphia Emma, information about the library’s copy and how it ended up in its collection, and covers from various editions of Emma in the library’s collection, runs through June 2016. Admission is free. If you can’t make it, check out the website for lots of interesting information about the exhibition. The “Philadelphia Emma” is in the top left corner. The open book is one of the facsimile editions created from the digitized pages, so that scholars can peruse the pages of this rare and fragile edition. An exciting part of the celebrations is the digitization of the library’s copy of the Philadelphia Emma. This digitization will allow scholars to study this edition, and compare it to other editions, without having to put any stress on the very fragile book itself. This digitization also allows the library to put a facsimile of the book online for all of us to enjoy. The digitization campaign continues: the library is planning the “addition of page-by-page comparisons between the first American and first English editions of Emma and the functionality of definition look-up, hyperlinked text, and further initiatives by scholars and enthusiasts that build on the digital text.” They are still raising funds for the second part of this initiative; please donate something if you can. Even a little bit adds up, and what a prize we will all have at the end of it! I was really happy to attend the opening event for Goucher College Library’s Emma in America exhibition. And don’t forget to check out their new website, Emma in America! Well, now I want to know more about Christian Broun Ramsay, Countess of Dalhousie, and her interest in Jane Austen and Emma. Thank you very much for highlighting the link with Nova Scotia, Maggie. 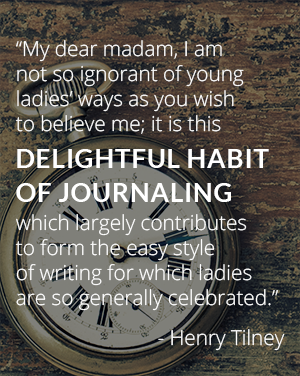 And thank you for writing about the exhibit and the digitization project. I wonder who owned the book between Lady D (as her husband called her) and Siegfried Sassoon.